Five-year Followup of Bupivacaine Treatment Patients. Ninety-two volunteer strabismus patients have received injection treatments with bupivacaine (BPX) and botulinum A toxin (BTXA), 45 of which satisfy criteria for inclusion in our ongoing formal study. Followups as long as 5 years support and extend findings previously reported (Scott, Alexander et al. 2007, Scott, Miller et al. 2009, Miller, Scott et al. 2013). 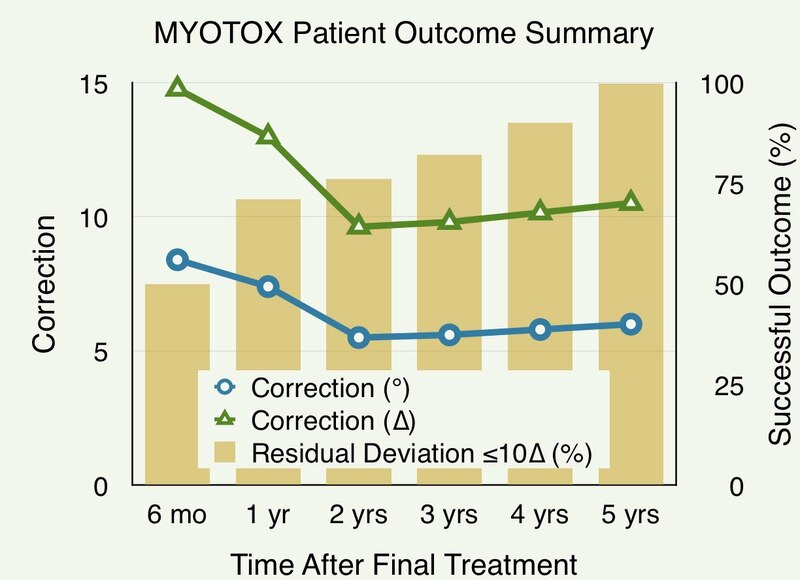 Alignment corrections measured 6 mo after treatment regressed somewhat over the next 1.5 years, but were subsequently stable at clinically significant levels. Most patients enjoyed successful treatment by the conventional criterion of residual deviation ≤10∆. Adjuvants. Ten patients received BPX with epinephrine, with the expectation that thevasoconstrictive action of the later would increase BPX effectiveness. Results suggest that larger misalignments can be corrected with this combination than with BPX alone. We have preliminary evidence (7 patients) that adding lidocaine further increases effectiveness of BPX injection treatment for strabismus. Debert I, Miller JM, Danh KK, Scott AB (2016). Pharmacologic Injection Treatment of Comitant Strabismus. (Author's Cut PDF). Scott AB, Miller JM (2014). Extraocular Muscle (EOM) Responses to Bupivacaine (BPX) Injection, Grant 1R01EY018633, Final Progress Report 1 Sep 2009 – 31 Aug 2014. (Report PDF). Purpose: Evaluate clinical effectiveness and anatomic changes resulting from bupivacaine injection into extraocular muscles to treat non-paralytic horizontal strabismus. Methods: We report a prospective observational clinical series of 31 comitant horizontal strabismus patients. Nineteen with esotropia received bupivacaine injections in the lateral rectus, and 12 with exotropia, in the medial rectus. 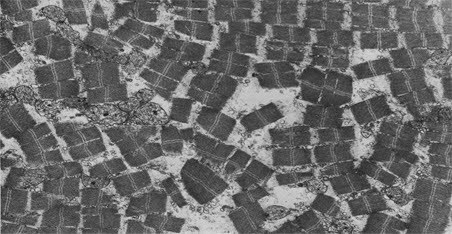 Sixteen of these, with large strabismus angles, also received botulinum type A toxin injections in the antagonist muscle at the same treatment session. A second treatment was given to 13 patients who had residual strabismus after the first. Clinical alignment measures and MRI-derived muscle volume, maximum crossectional area, and shape, with followups from 6 mo to 3 yrs. Results: At average 15.3 mo after the final treatment, original misalignment was reduced by 10.5∆ (6.0°) with residual deviations 10∆ in 53% of patients. A single treatment with bupivacaine alone reduced misalignment at 11.3 mo by 4.7∆ (2.7°) with residual deviations 10∆ in 50% of patients. Alignment corrections were remarkably stable over followups as long as 3 yrs. 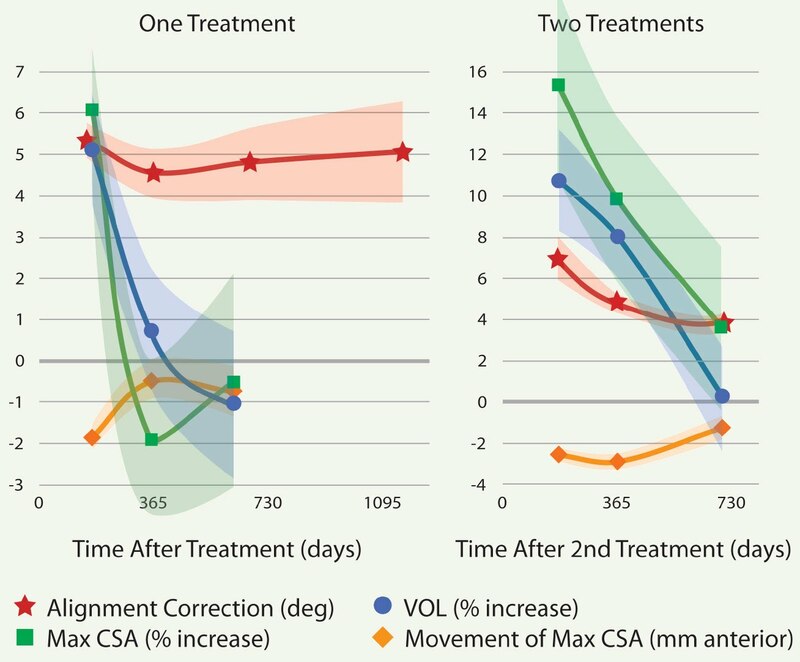 Six months after bupivacaine injection, muscle volume had increased by 6.6%, and maximum crossectional area by 8.5%, gradually relaxing towards pre-treatment values thereafter. Biomechanical modeling with Orbit™1.8 suggests that changes in agonist and antagonist muscle lengths were responsible for the enduring changes in eye alignment. Conclusions: Bupivacaine injection alone or together with botulium toxin injection in the antagonist improves eye alignment in comitant horizontal strabismus by inducing changes in rectus muscle structure and length. Scott AB, Alexander DE, Miller JM (2007). Bupivacaine injection of eye muscles to treat strabismus. Br J Ophthalmol, vol 91, isu 2, pgs 146-148 (Paper PDF; PubMed Central). Scott AB, Miller JM, Shieh BS (2009). Bupivacaine injection of the lateral rectus muscle to treat esotropia. Journal of AAPOS, vol 13, pgs 119-122 (Paper PDF). Scott AB, Miller JM, Shieh BS (2009). Treating strabismus by injecting the agonist muscle with bupivacaine and the antagonist with botulinum toxin. Trans Am Ophthalmol Soc, vol 107, pgs 104-111 (Paper PDF; PubMed Central).